The Best Electric Guitars for Beginners in 2019: Reviewed and Rated! Getting into music is easy when you have the best electric guitar for beginners. But with so many starter electric guitars to choose from, how do you know the one you’re getting won’t make you end up frustrated, ready to throw your axe away? We’re here to help. We’ve selected the best of the bunch, focusing on the qualities of a guitar that are most helpful for new players. There’s comfort and playability, sound quality, construction and of course, value for money so you can make sure the guitar you’re investing in is a wise and worthwhile purchase. Let’s begin! Fender Standard Stratocaster HSS Electric Guitar If you can afford a Fender for your first electric guitar, go for it! We recommend the Fender Standard Stratocaster, which can meet your demands long after you’ve graduated from the beginner level. With a classic tone and look, this Fender Strat is one electric guitar that can see you through all the way from practice sessions to paid gigs. Squier Standard Telecaster Electric Guitar If you’ve always wanted a Tele from the get-go but your budget isn’t letting you get a Fender, get the Squier version instead. It’s one of the best beginner electric guitars you can get that won’t break the bank. Modeled on a Tele from the late Sixties, the Standard Telecaster from Squier features dual single-coil Tele pickups with three-way switching. 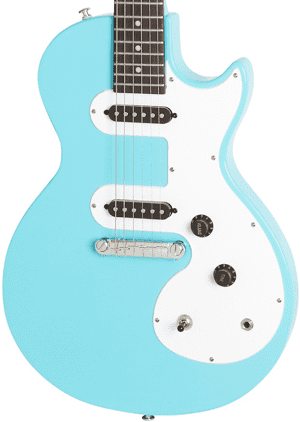 Epiphone Les Paul SL Electric Guitar Another great electric guitar for beginners is the Epiphone Les Paul SL, touted as the brand’s most affordable 2-pickup Les Paul model ever. The Les Paul SL has a slim, compact and lightweight poplar body, mahogany neck, ceramic single-coil pickups and straightforward controls. It’s available in six colors too so you can choose which one appeals to you the most. Schecter Omen Extreme 6 Electric Guitar The Schecter Omen Extreme-6 looks impressive and sounds amazing too. This is another great guitar investment for beginners who are looking for a quality instrument at a reasonable price. The Omen 6 features a basswood body and a sturdy, bright-sounding bolt-on maple neck, a smooth rosewood fingerboard, Schecter Diamond Plus pickups and a string-through-body construction for added sustain and resonance. Ibanez RG450DXB Electric Guitar Another Ibanez on this list of top electric guitars for beginners is the RG450DXB. Part of the popular RG series, the Ibanez RG450DXB features a mahogany body, a maple neck with a Wizard III neck shape, a rosewood fingerboard with 24 frets and three Quantum pickups. A five-way lever along with master tone and volume controls allows for tonal variety. For those who have saved up enough money for a Fender, consider getting the Standard Stratocaster. Long been held in high regard for its quality tone and legendary looks, the Fender Standard Stratocaster is many a musician’s dream guitar. The Standard Strat boasts a classic maple neck with a comfortable modern C shape. The front finish is gloss urethane while the back has a smooth satin urethane finish. Maple is used for the fingerboard as well. The 21 medium jumbo frets are well-laid with no sharp edges. The fingerboard has black or white dot inlays, depending on the color of the guitar. The Brown Sunburst variant has black dot inlays while the Tobacco Sunburst model has white inlays. The Fender Standard Stratocaster has three classic single-coil pickups at the bridge, middle and neck positions for a full range of tones. You can shape your tone via the five-way pickup selector. The versatile pickup configuration along with the pickup switching feature allows players to come up with a wide variety of tonal flavors. This Strat also has a vintage-style synchronized tremolo bridge with a high-mass block for added sustain and greater tuning stability. You’d better get practicing those whammy bar techniques! It’s important for guitar players to have a good instrument right from the start, even if you’re working with a sub-$300 budget. If $300 is your limit, don’t worry because there are several fantastic electric guitar models you can go for, like this one. The Squier Standard Telecaster has that classic Tele look, feel and sound but without the usual Tele price, making it a top choice for beginners. Designed for beginners, the Squier Standard Telecaster has a sturdy basswood/agathis body and a clean-sounding maple neck. The neck’s C-shaped profile, which is modeled after a late ‘60s Telecaster, gives a vintage-style playing feel. The neck has a smooth satin urethane finish, making sure that moving up and down the neck is a comfortable and easy experience. The rosewood fretboard with 22 medium jumbo frets is also easy on the fingers. Squier’s Standard Tele is equipped with dual single-coil pickups with a three-way switching feature. There’s a hot one at the bridge position, which gives just the right bite when you’re playing lead, while the one at the neck position provides warmth when you need it. The chrome-covered pickup at the neck is a classic Tele design element. Another iconic series in the world of electric guitars is the Les Paul. If you’re looking to get a Les Paul at an extremely pocket-friendly price, look no further than Epiphone’s catalog and pick out the Epiphone Les Paul SL. It boasts the lowest price tag ever for a Les Paul with two pickups and it’s something all guitarists – not just beginners – would be proud to have. The Epiphone Les Paul SL has a compact and slim body made of poplar. It’s incredibly lightweight, making it easier for beginners to play even during long practice hours. The bolt-on neck is made of mahogany and it features a 1960’s-style SlimTaper D-shaped profile. The fingerboard has 22 medium jumbo frets and pearloid dot inlays. This beginner-friendly electric guitar is equipped with Epiphone ceramic single-coil pickups at the neck and bridge positions. Tone shaping is done via the 3-way pickup selector switch and there are controls for master tone and master volume. Other specs include chrome hardware and premium covered machine heads. The Epiphone Les Paul SL is available in Ebony, Vintage Sunburst, Turquoise, Sunset Yellow, Pacific Blue and Heritage Cherry Sunburst colors. The Schecter Omen Extreme-6, or Omen-6, is a fierce-looking piece of equipment you won’t regret getting as your first electric guitar. The Omen-6 boasts a sleek mahogany body with a carved quilted maple top and double cutaways. The cutaways provide fast and easy access to the upper frets on the bolt-on maple neck. Topping the neck is a rosewood fretboard with 24 X-Jumbo frets. The maple neck gives off a bright tone and full sustain and is perfectly paired with the mahogany body, which produces warm midrange tones. What makes this electric guitar extra special is its string-through-body construction. It has a Tune-O-Matic bridge and the Schecter String Thru Body tail for added sustain, along with extra string tension and enhanced clarity. The Schecter Omen-6 is equipped with two Diamond Plus pickups. The high-output alnico humbuckers allow players to experiment with a wide array of tones, so whether you’ve got a feel for metalcore or want to play mostly blues, this guitar can see you through. Beginners don’t have to worry about controls either, as these are straightforward. You have one volume and one tone control knob with push/pull coil splitting and a three-way switch for toggling between configurations. One of the models in the much-favored RG series of solid body electrics, the Ibanez RG450DXB is our final pick for this list of the best electric guitars for beginners. Like the other models in the series, the RG450DXB features an offset double cutaway design. Its mahogany body has a contoured back, making it more ergonomic and comfortable to hold. At first glance it looks like a Fender Strat, only its horns are pointier and thinner and its edges are less rounded. As an RG model, the Ibanez RG450DXB also has an ultrathin and fast neck. It has a Wizard III three-piece maple neck, which is characterized by its flat and wide profile. The thickness and the width increases gradually as you make your way up the fretboard. The fretboard has binding and is made of rosewood (jatoba if you get the 2018 version). It has 24 jumbo frets to make bending notes an easier affair. Sharktooth inlays serve as position markers. As for the electronics, the Ibanez RG450DXB boasts an HSH pickup configuration with Quantum pups at the neck, middle and bridge positions. There’s a five-way pickup selector and controls for the master volume and master tone. Looking for the best electric guitar for beginners online can be tricky, mostly because you can’t really see and hold guitars in person. You would have to rely on photos, videos, reviews and a multitude of comments and opinions from other people. With all these visuals and voices, how do you ultimately choose the electric guitar that suits you best? You’ve come to one of the best places on the internet for information and advice on the best starter electric guitars. We’ve already picked out some of the most highly recommended models to narrow down your search. Now we’re going to help you review the things you need to think about when it’s time to make your decision. Before anything else, we would just like to let you know that you won’t go wrong with choosing any of the electric guitars on this list. Because people have different needs and personal preferences, one model is not necessarily better than the other overall. It’s up to you to decide which one is best for you. Let this be your guide! How much you can and are willing to spend on an electric guitar is usually the first factor that beginners take into consideration. The wide variety of electric guitars available ensures that whatever your budget, there’s a good-quality guitar out there for you. When setting a budget, it’s important to note that you won’t be buying just a guitar – you’ll need to purchase an amp, a cable and accessories such as a guitar strap, an extra set of strings and some picks. Consider these other expenses when buying your electric guitar. If learning guitar without spending too much is your goal, consider purchasing a guitar bundle or starter kit, which bundle an electric guitar with accessories. These starter kits may also include online lessons, instructional DVDs and booklets as well as other resources to help you out as you learn to play guitar. Electric guitars come in three basic body types: solid body, semi-hollow body and hollow body. Each type has its own characteristics in terms of construction and tonal output. Solid body guitars are made from a solid piece or slab of wood and are the most common, with a versatile tone that suits most music genres. Semi-hollow body guitars has a solid center wood block and chambered sides. The chambered design results in added resonance and sustain. Hollow body guitars have hollow bodies like acoustic guitars and produce an even greater resonance. The downside to hollow body guitars is that they are prone to feedback, which fortunately can be addressed with a good set of electronics and a quality amp. The body type to choose should be the one that not only appeals to you but also one that would serve your needs well. If you want to play a lot of jazz, a hollow body guitar is the way to go because of its rich tones and warm, deep bass response. If you’re more into heavy metal, a solid body guitar would be more suitable for you. As with acoustic guitars, the woods used in an electric guitar also affect its tonal output, but to a lesser degree. The resonant qualities of a tonewood determines how long the strings on an electric guitar vibrate and how much the pickup is able to move as well. When choosing the best electric guitar for beginners, you may encounter a lot of different tonewoods. There’s mahogany, maple, ebony, poplar, basswood, rosewood, alder, ash, nato and agathis, among others. Alder bodies are often paired with a maple neck and this is a common combination for beginner electric guitars. Alder is lightweight and offers good resonance, plus it’s less expensive compared to other types of wood. The kind and quality of wood used in an electric guitar would determine not only how it sounds, looks and feels in your hand but also how much it costs. Shop around for the best value. How the neck is constructed, shaped and attached to the neck also affects a guitar’s performance and its playability. Necks come in different shapes or profiles, such as C, D and U shapes. Some are also tapered while some are wide or thin. The overall construction of the neck will determine how comfortable you will be when playing. For beginners, it’s ideal to try out different guitars with different neck shapes to see which one you feel most comfortable playing. Electric guitar necks can also be set, bolted on or have a neck-through-body construction. Set necks are designed to fit into the body of the guitar and are glued in place. Done well, a set neck looks like it’s actually part of the body. Set necks offer a lot of resonance, sustain and stability. Bolt-on necks aren’t glued but attached to the body using bolts, as the term implies. A set neck doesn’t offer as much sustain and resonance than a set neck, but it does make neck repairs or replacements easier. If you’re planning on customizing your guitar in the future, one with a bolt-on neck would be a good platform for doing so. Electric guitars with a neck-through-body construction feature a neck that extends along their length – the neck and body are one, with wings glued to to sides to make up the rest of the guitar body. Because its neck and body are one solid piece, a neck-through electric guitar has the most resonance, sustain and stability. Pickups, the most common of which are single-coil pickups, capture the vibrations of the guitar strings and convert them into an electronic signal. Along with an amp, the tone and volume controls and pickup switching on an electric guitar allow you to tweak your sound. Single-coils are great for a variety of music styles such as pop, folk rock and country. There are also humbucker pickups, which has two single-coil pickups wound together. Humbuckers work to eliminate hum – thus the name. These pickups usually have a more powerful and louder output, making humbuckers ideal for music styles that call for a thicker and more aggressive sound such as jazz, rock and heavy metal. When choosing a starter guitar, consider the type of music you’ll be spending most of your time playing. If you like a particular model but the reviews on its pickups aren’t that satisfactory, make a note of it and consider adding “new pickups” on your to-buy list. This is perfectly fine. Any experienced guitar player will tell you that you don’t have to stick with the pickups installed on your guitar. It’s true, unless of course you’re 100 percent happy with the way your guitar’s pickups perform. There are many pickup models available and one thing’s for sure: no matter how nice the wood on your guitar is, if your pickups are terrible, it’s not likely you’ll be getting a nice sound out of your guitar. How an electric guitar looks is also a deciding factor – after all, it’s often the first thing you notice about a guitar. Whether it’s a sleek black axe or a rock-out red sunburst model, you immediately get drawn to a particular look and come back to it. We say if a specific model calls to you, by all means get it – or at least something that looks like it, if budget constraints prevent you from getting the real thing. If you really like how your electric guitar looks, you’re more likely to play it and be motivated to pick it up even on days you feel too exhausted to practice. For beginners, this is a big deal. Don’t just settle for any guitar – choose one that you’re attracted to, and you’ll find yourself not wanting to let go. You’ll practice more, keep your guitar clean and well-maintained and give it all the TLC it needs. It may not be the beginner’s electric guitar other people would tell you to play, but for you it’s The One – and honestly that’s all that matters! We hope this list helps you find your own sweet partner in your music journey. There may be rough times ahead as you learn to play, but with the right electric guitar by your side there’s nothing stopping you from achieving your goals. We wish you good luck, good licks and good times playing electric guitar. Have fun!